It was a typical Saturday afternoon in Igloolik, January 1997: The temperature was minus 30 C with blowing snow, so more like minus 60 C. It was still pitch black outside, despite the increasing minutes of sunlight around noon every day. Inside the Kipsigak arena, a brisk game of hockey was underway. There I found James Ungalaq and Celestino Uyarak discussing the weekend hockey tournament between the Igloolik Suns, the Assassins, Aqviqs and Eskimos. With no paid staff, their volunteer-run hockey association kept the arena open and found coaches and referees for the many players in the community. It was taking volunteers an hour and a half to sweep the arena, then another hour to flood the ice. On weekends, there was more even work and 14-hour-long days at the arena. If the rink had been able to have a zamboni to groom the ice, the ice might have been ready much earlier for the kids, who looked forward to skating every day after school. That’s why Ungalaq and Uyarak set their sights on a zamboni — the hamlet was willing to give them $50,000 if, by March 31, they could fundraise the additional $20,000 needed to buy the ice-grooming machine. In January, they were still $9,000 away from meeting that goal. Maple Leafs fan Uyarak, who was unemployed in 1997, spent nearly all his time at the rink. “I’m not a hunter, either. This is one thing I was never good at. If I have a choice to go hunting or play hockey, I’d play hockey,” he said. Hockey had helped him over the previous two years, he said. Ungalaq, then a student at Nunavut Arctic College, said he didn’t think there was a problem with Inuit turning from traditional activities to hockey. “It’s always been a matter of survival for us. If it makes them happier… they should be hockey players,” he said. 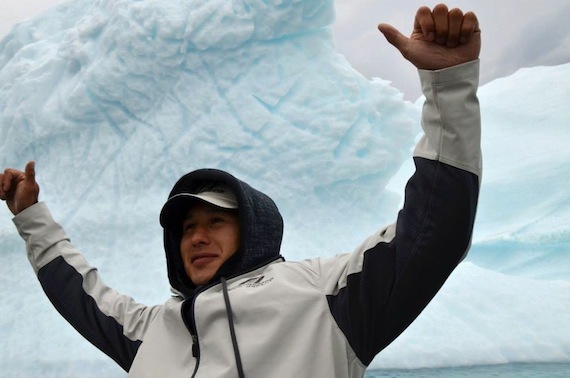 Ungalaq said he couldn’t wait until there would be an Inuk player in the National Hockey League — which didn’t happen until 2003, when Jordin Tootoo of Rankin Inlet joined the Nashville Predators. “There’s about 24,000 Inuit up North and if the NHL gets one Inuk player, all those 24,000 Inuit will root for the team, that’s for sure,” Ungalaq said. 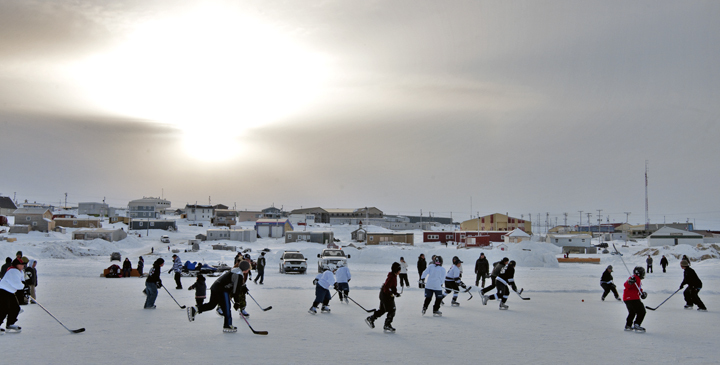 But I learned that the game of hockey, as it was played in Igloolik, wasn’t quite the same as in the South. “The first night I played in the arena, there was a stick duel going on. It was a pick-up game before the teams were formed for the season,” said the high school principal, Doug MacLean, when we crossed paths in the arena. Still MacLean said he saw respect for age played out at the rink, with younger kids obeying the older ones. “It’s not a traditional kind of respect because it’s in a non-traditional setting, but it does underscore a traditional set of values which does exist in the communities, and a place where you’ll see it” — unlike at school, he added. 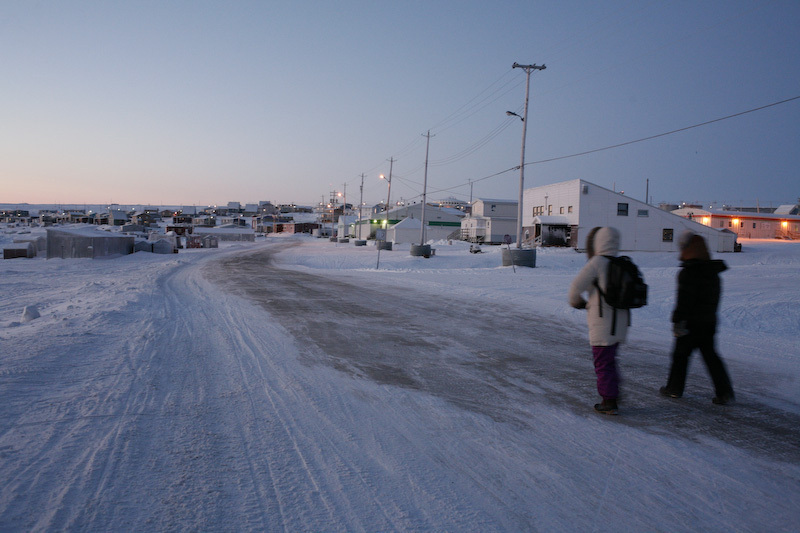 When I left Igloolik after more than two weeks in the community, on a flight scheduled between two storms, I arrived back in Iqaluit where it feels light and balmy, although it was still way below zero. 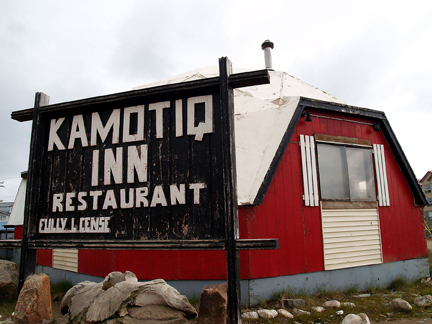 I meet a journalist at the Nunatsiaq News (where I would start to work full-time only later in 1997) for pizza and beer at the Kamotiq Inn, an igloo-shaped landmark at Iqaluit’s main intersection, the Four Corners — which was torn down in 2008. Afterwards, I went to a friend’s apartment where I cuddled up under a warm quilt. The stomach pains which plagued me in Igloolik were gone and I felt sunny again. 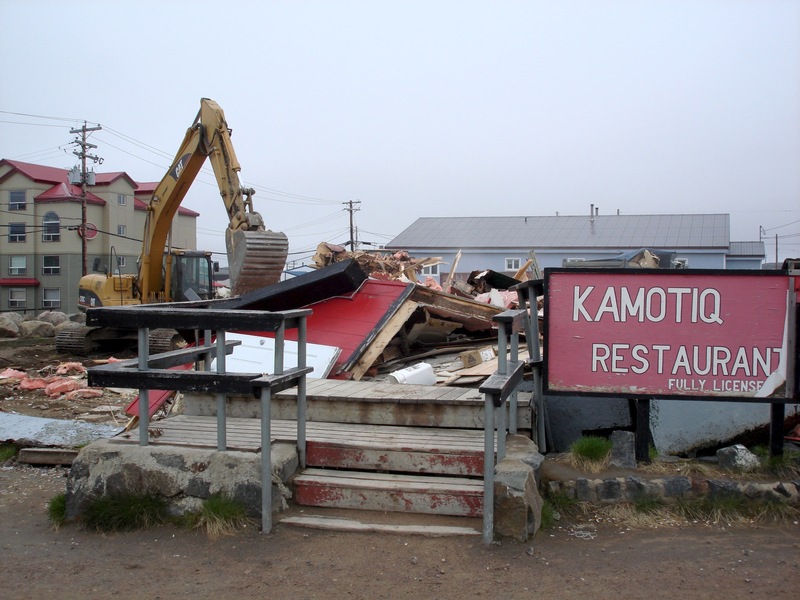 Not long after my visit to Igloolik, I learned that a zamboni was on order for the Kipsigak rink. The next instalment of Like an iceberg goes live May 9. ← Like an iceberg, 1997, “Qaggiq” cont.